Location Ellerton Moor. Above Juniper Gill. Record Name ELL07 Ellerton Moor. 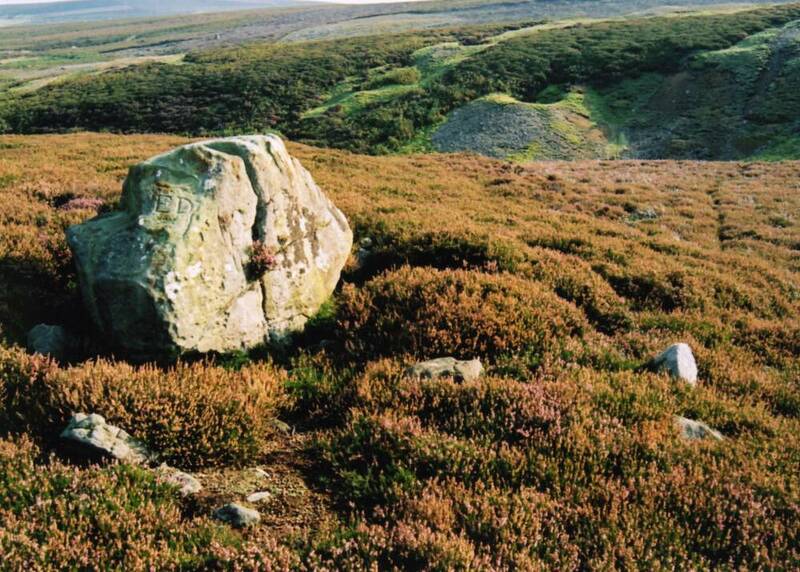 Standing stone above Juniper Gill. Record Description See photos. Large slab of sandstone set on edge reused as a boundary marker (ELL08). 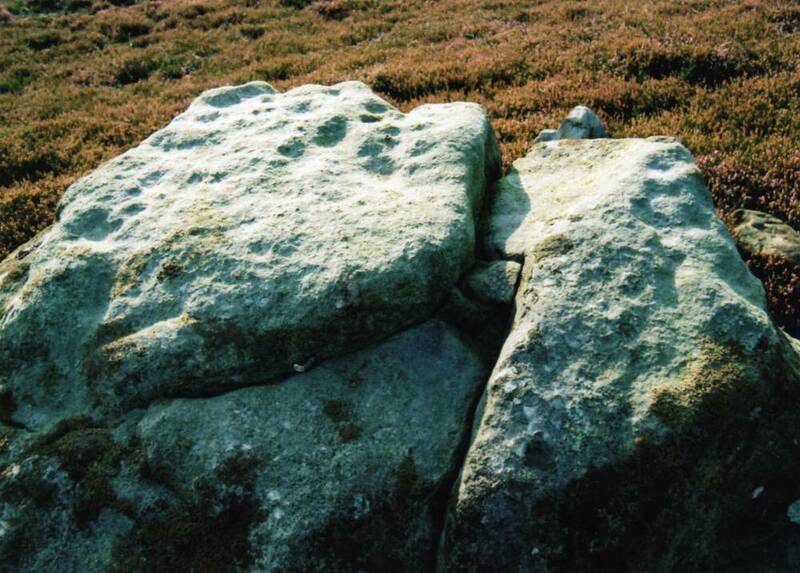 This standing stone has been described as cup marked on the top surface. (Beckensall and Laurie, 1998 p103). Whereas there are indeed depressions on the top surface of this rock, the writer now considers that these are the result of natural weathering over millennia- perhaps confirming that this rock has been standing since antiquity. 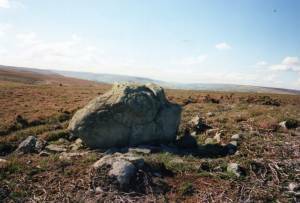 The location of this standing slab of sandstone is very significant since it marks the very point where the high Fells which overlook the Eden Valley first become visible across Stainmore to the traveller on foot from the South and East (from the Vale of Mowbray)to the North and West (The Vale of Eden. 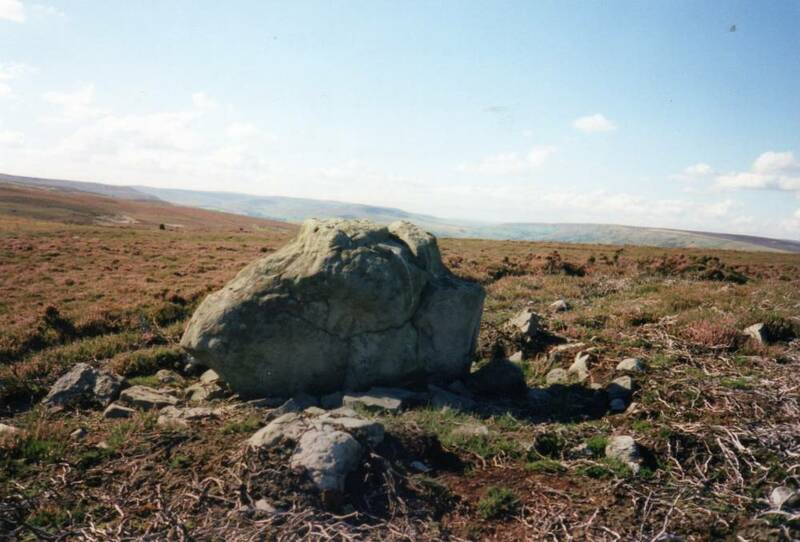 The location of this Rock can be seen (if you have good eyesight) on the skyline from the Mud Beck Stone Circle which is KM to the NW and from the modern road at Half Penny House some KM to the SE. Additional Notes This standing stone appears to be set within the remains of a small cairn. 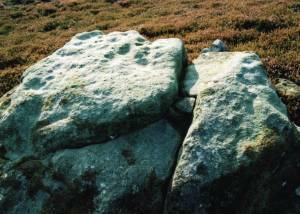 The new drivable track cut through a second cairn just to the north of this rock. Image 2 Description Cup marked, perhaps? If in doubt dismiss the idea! Image 3 Description The Standing Stone reused as a Boundary Stone. ED refers to Edward Drax of Ellerton.